Comprehensive retirement planning is our specialty. Your last paycheck must last you the rest of your life. We offer services to help you lower your taxes, help earn income, get the most from your pension plan & maximize your social security benefits. This will allow you to stretch that last paycheck for you and your loved ones. 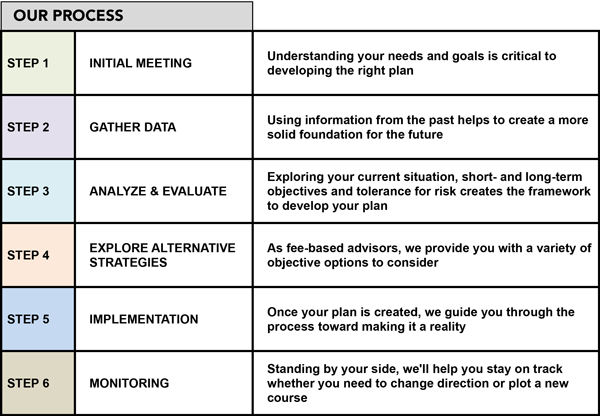 The investment and financial planning process is difficult to maneuver and time consuming. We are here to help ease that burden. Let us take your hand and help guide you down a path toward prosperity. We consider ourselves the quarterback in the planning process. We organize the players and get you to the specialists that are needed to implement and execute your financial plan. Our biggest success is that we help GET THINGS DONE!